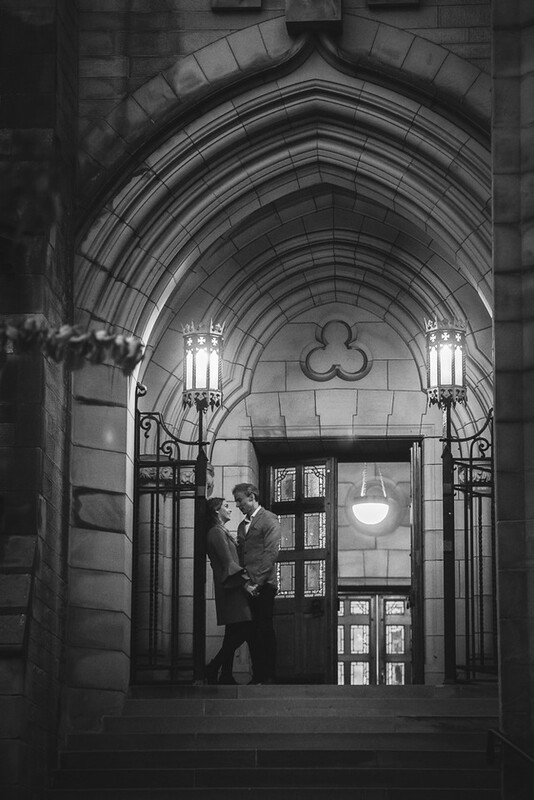 For anyone who is considering a pre-wedding shoot with their photographer I would highly recommend it. 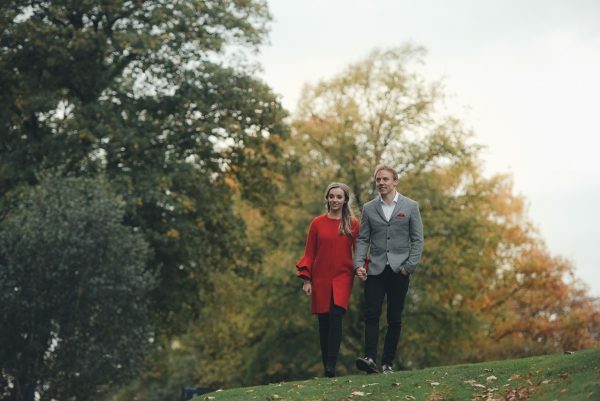 Megan & Rory Brechin met with their photographer from ImacImages a couple of weeks before their wedding for a pre-wedding shoot around the West End. 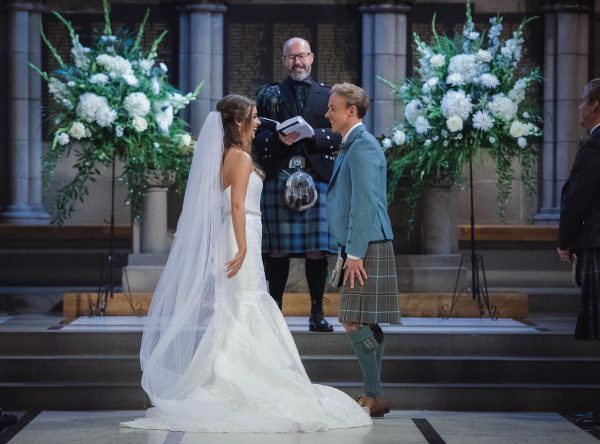 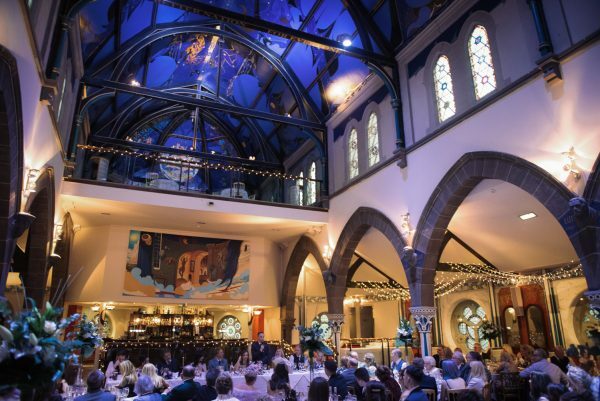 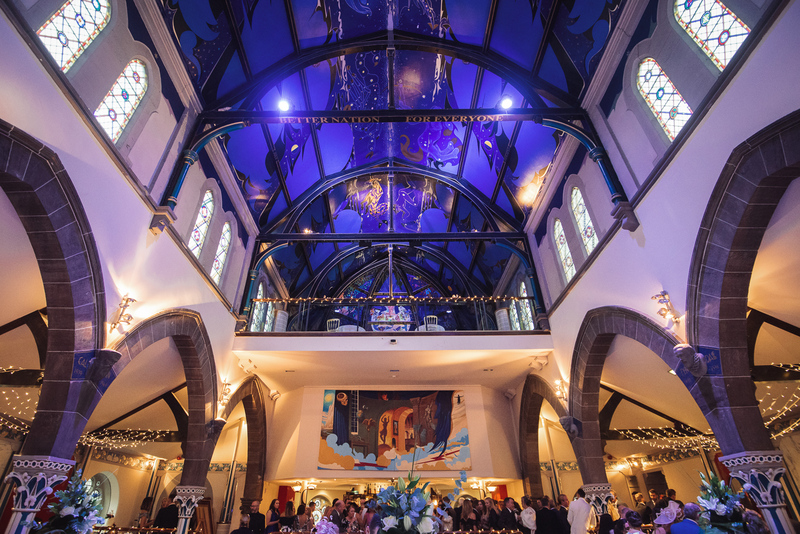 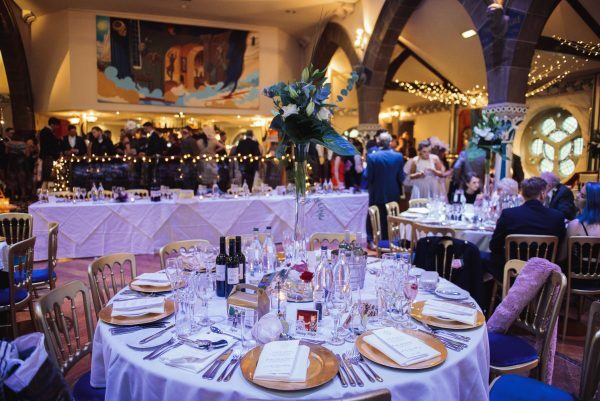 The couple visited their wedding ceremony venue, The University of Glasgow Chapel followed by other scenic outdoor locations in the West End. A pre-wedding shoot allows a photographer to get to know and gauge the couple ahead of their big day, and of course allows a couple to get to know their photographer too. 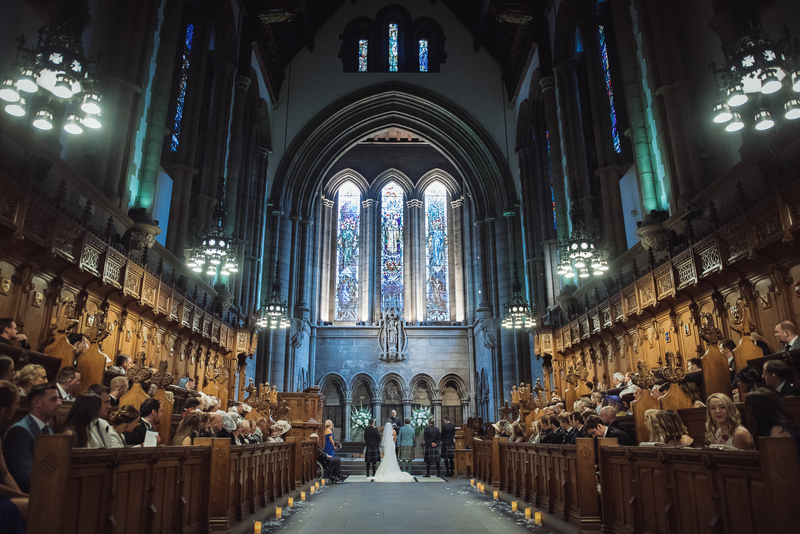 Megan and Rory got married on Saturday 27th of October 2017 at The University of Glasgow Chapel. 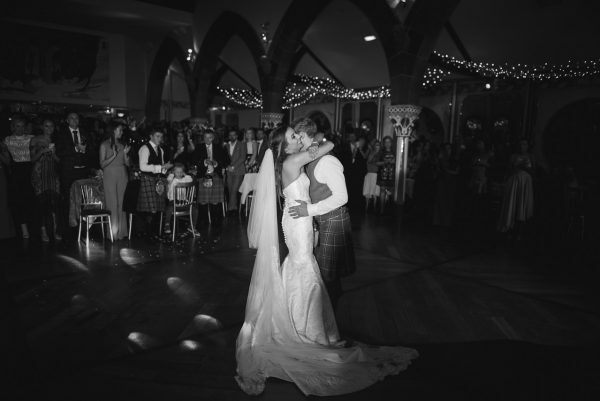 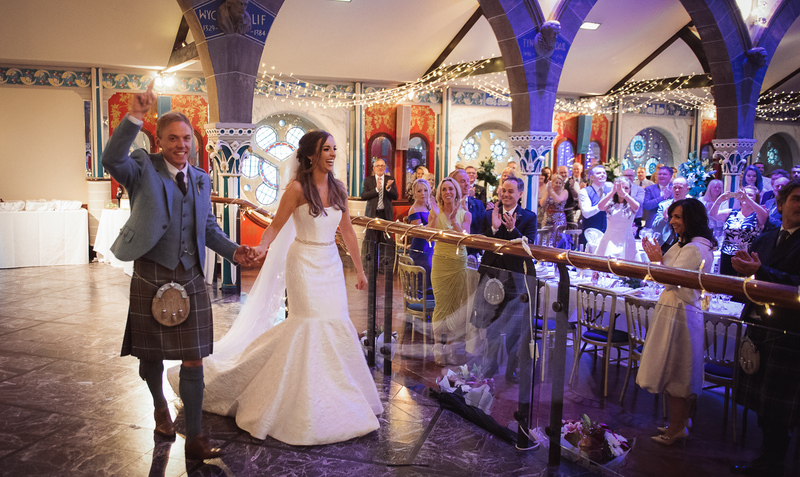 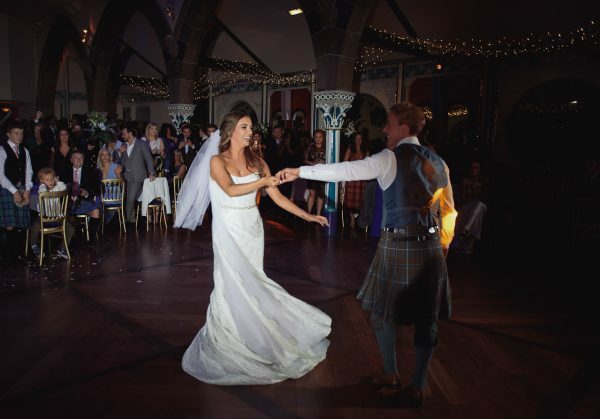 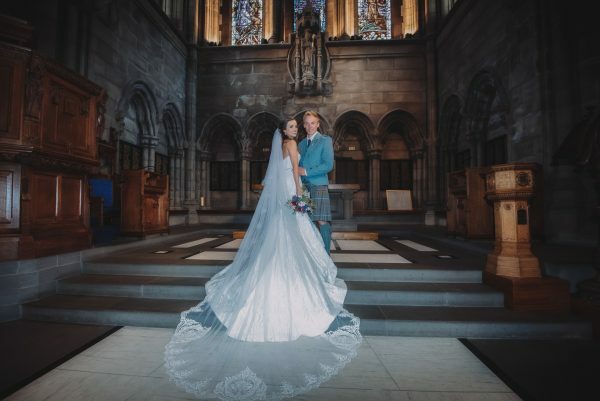 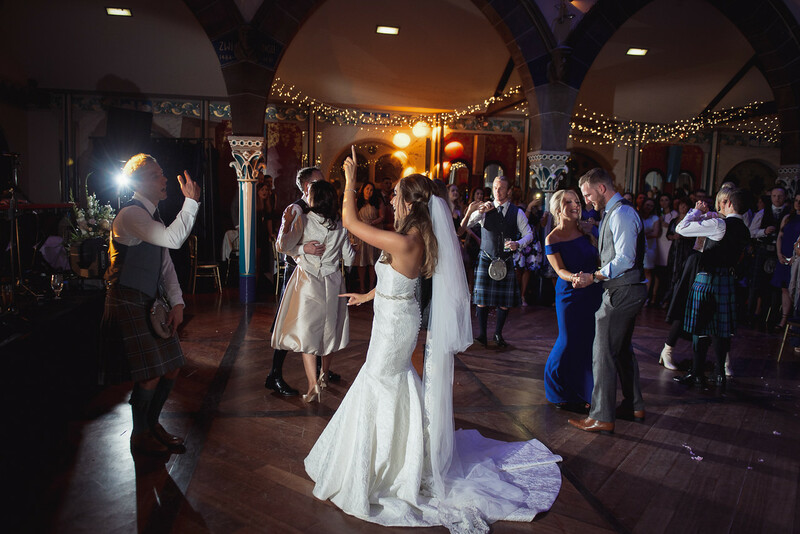 Megan arrived in her Suzanne Veville dress, purchased at Eleganza Glasgow and walked the long chapel aisle which was lined beautifully with LED pillar candles and rose petals. The ceremony music was played by Capella String Quartet, who were accompanied throughout the ceremony by Megan’s good friend Meg Taylor who sang At Last by Etta James. More of Megan’s talented friends Vicki, Marina, Clare, Heather & Eve also sang a stunning acapella version of God Only Knows by the Beach Boys. 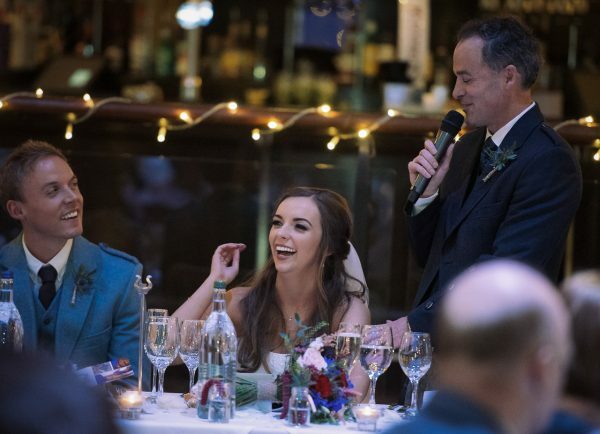 I think it’s safe to say Megan has a talented bunch of girlfriends! 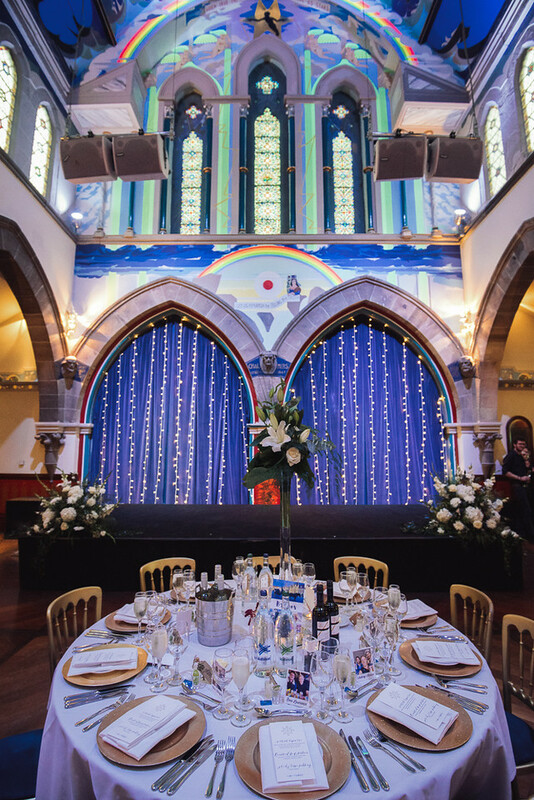 Guests arrived at Òran Mór around 3.30pm where they were welcomed with a glass of fizz and a stunning set up in our Auditorium. 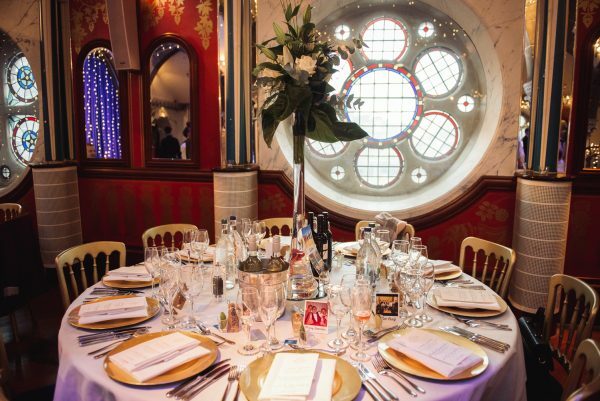 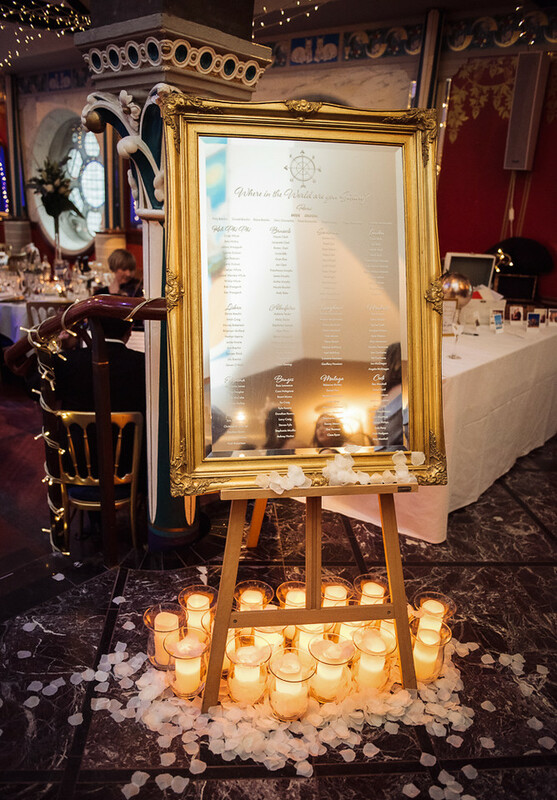 Make Believe Events provided the standard Òran Mór fairy light package and large gold charger plates for each guest’s table position. 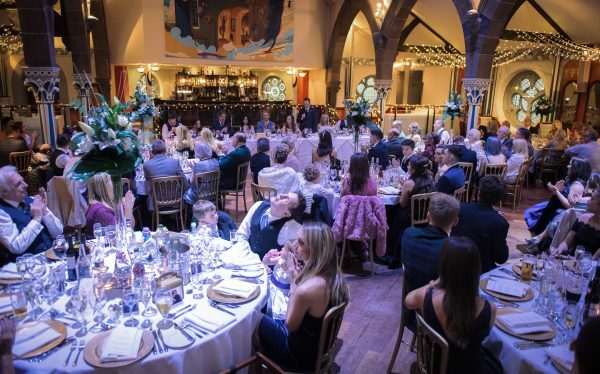 The couple’s tall floral centrepieces were provided by Rory’s mother as well as their large gold mirror table plan which worked perfectly with the gold charger plates, and our gold Brentwood chairs. The LED candles from the University chapel were then brought along to the Auditorium to complete the table plan vision. 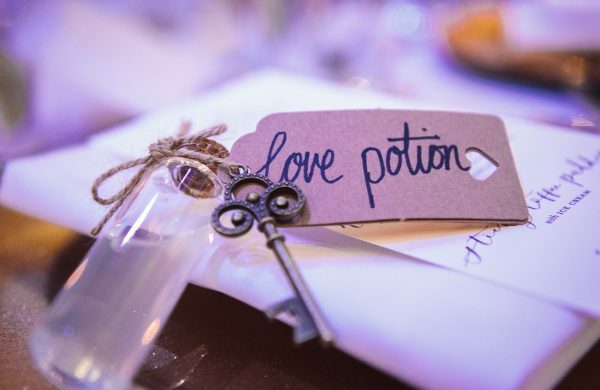 Each guest had a personalised Polaroid picture at their place setting with a picture of them and either Rory or Megan, as well as a shot of Tequila and lime which was creatively signed with a tag and metal key reading ‘Love Potion’. 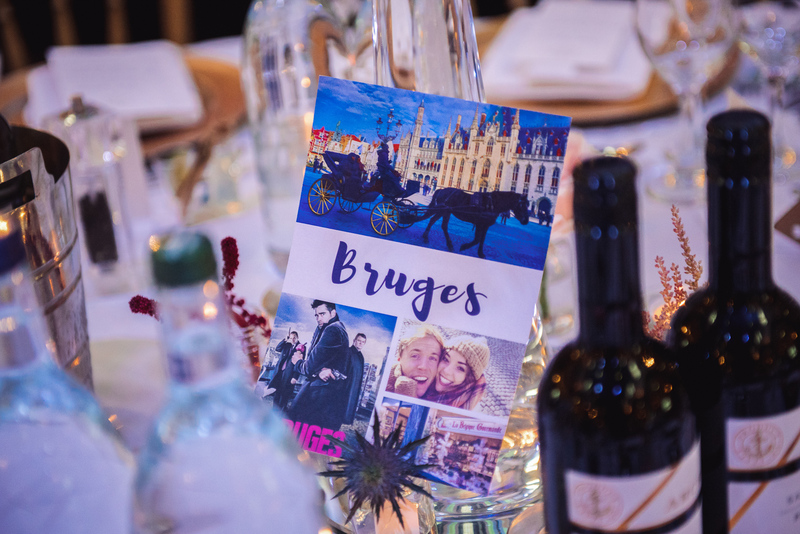 Megan and Rory opted for a travelling theme for their wedding day and named each of their tables after countries they had visited. 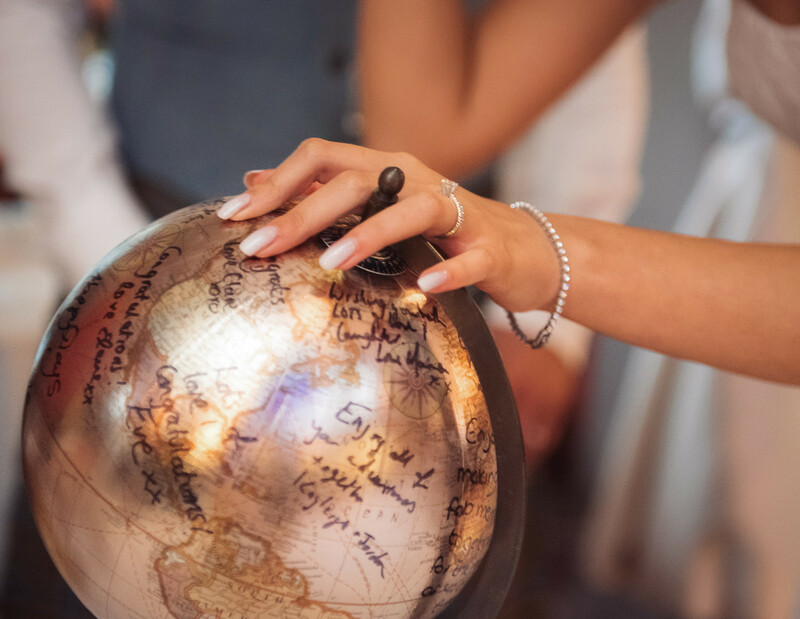 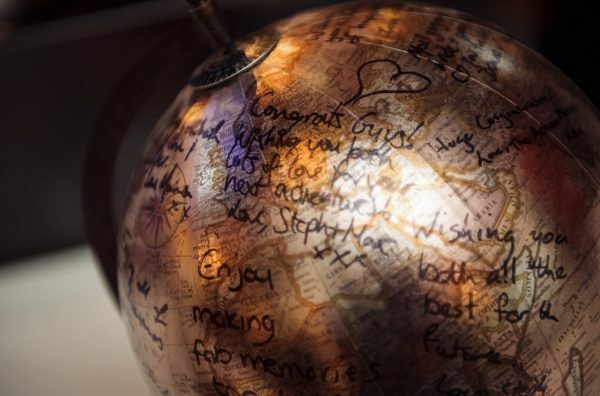 This theme was then continued on to their guestbook table where guests were asked to sign a stunning gold globe sending the newly weds their well wishes. 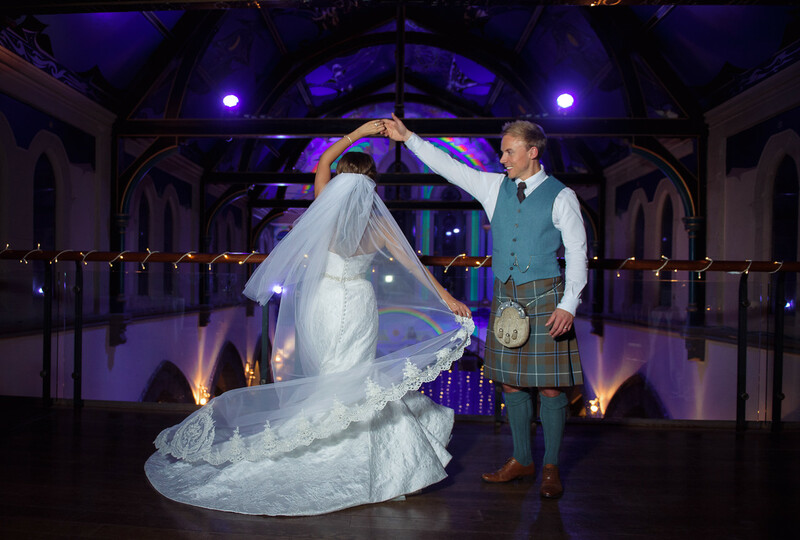 The couple had an exceptional wedding day which was captured perfectly by the team at ImacImages Photography. 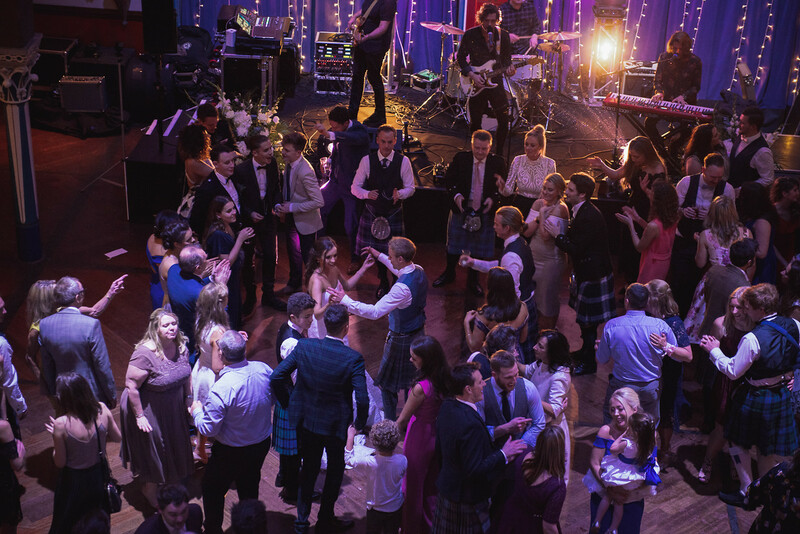 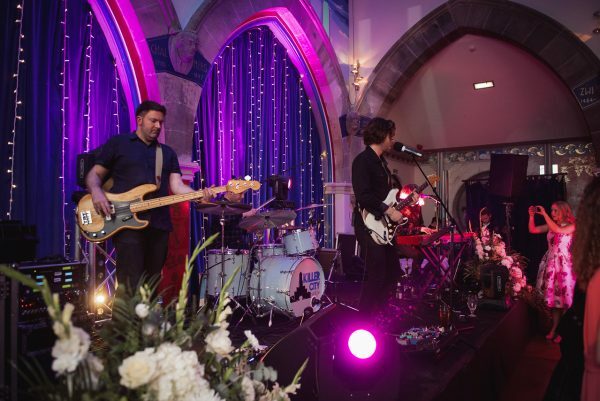 Rory and Megan embraced every moment of their wedding day including completely owning the dance floor, accompanied by their band Killer City Sound. The new Mr & Mrs Brechin concluded their wedding story by jetting off to Thailand for their honeymoon… and I in fact happened to be in Thailand at the same time – I promise I wasn’t trying to be a honeymoon crasher! Rory recently got in touch to inform me of his new business venture, where he has started his own videography company RHB Media. 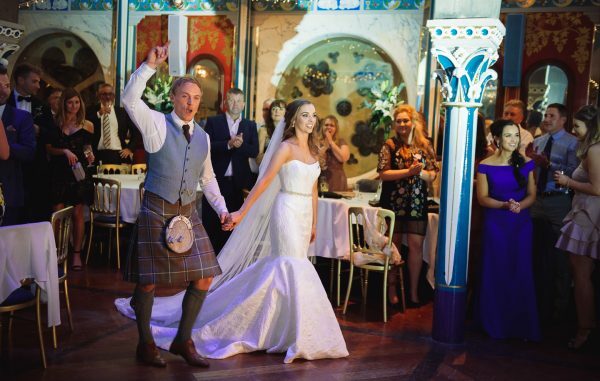 In the last year he has been working with couples at some stunning wedding venues creating great videos for newlyweds in some spectacular locations such as Italy & Lisbon. 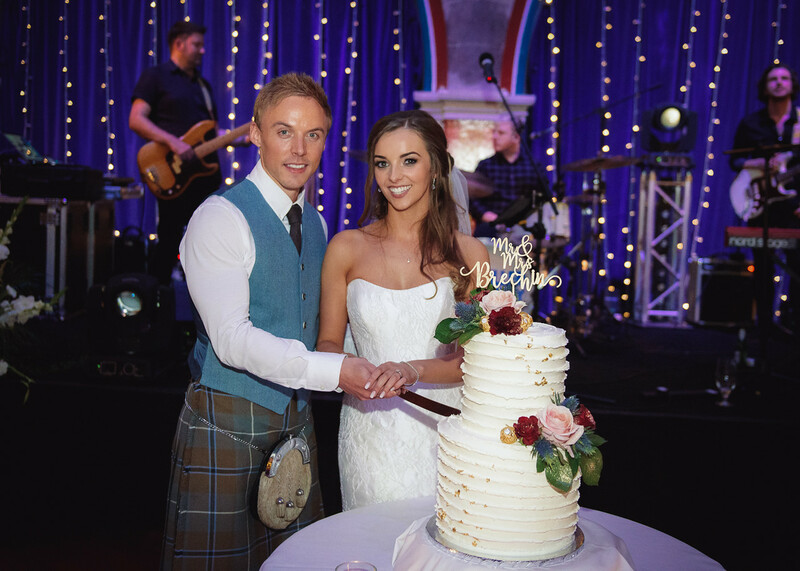 Rory is keen to kick start his career in the wedding industry and will be attending our next Wedding Fayre in early 2019, where he has also promised to help promote the venue for me as a former Òran Mór Groom! 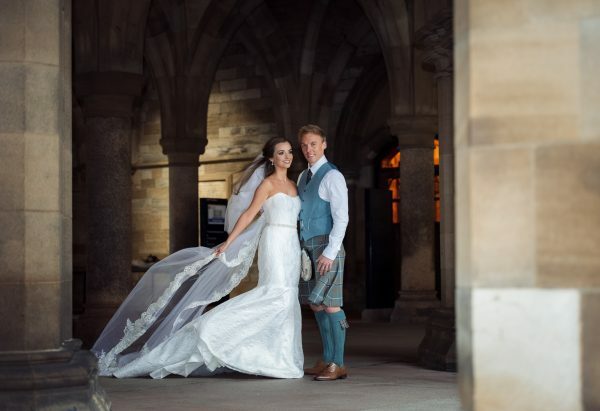 Megan & Rory’s wedding video was provided by a good friend of Rory’s who he works with regularly.